Your Style. Filtered. Youre not just washing with H2O! Scary, right Chlorine, lead, and mercury are all contaminants that can be found in your shower water. Protect yourself with the VivaSpring filtered shower head so you are not absorbing them through your skin or inhaling them through your shower steam. The VivaSpring shower head uses patented technology to reduce these contaminants, and as a bonus, the process also has a mild anti-bacterial effect. This means youre using safe, clean water when washing your most vulnerable and precious commodity yourself! VivaSpring Filtered Showerhead in Chrome with Slate Face Your Style. Filtered. Youre not just washing with H2O! Scary, right Chlorine, lead, and mercury are all contaminants that can be found in your shower water. Protect yourself with the VivaSpring filtered shower head so you are not absorbing them through your skin or inhaling them through your shower steam. The VivaSpring shower head uses patented technology to reduce these contaminants, and as a bonus, the process also has a mild anti-bacterial effect. This means youre using safe, clean water when washing your most vulnerable and precious commodity yourself! 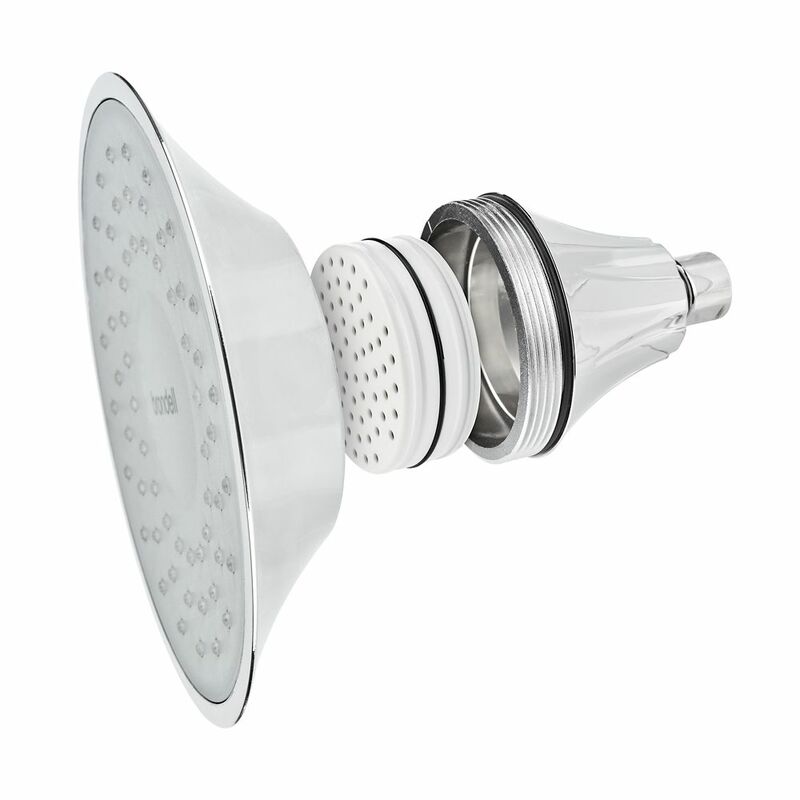 VivaSpring Filtered Showerhead in Chrome with Slate Face is rated 5.0 out of 5 by 22. Rated 5 out of 5 by debbiecakes from Just installed this new filter and so far, it seems like the water pressure is excellent and it w... Just installed this new filter and so far, it seems like the water pressure is excellent and it was much better than the old Aquasana Filter I had used for years. The cost was much better too. I like the ease of installation on this one. Including the plumbers tape in with the kit was very nice too. Rated 4 out of 5 by Daniel from excellent product as it softens water as described, no replacement... excellent product as it softens water as described, no replacement filters though. Rated 5 out of 5 by Linda0524 from Incremenetally better water even with a whole house softner! I live in FL and have always been challenged with the affects of hard water. Although my house has a water softener, I always felt as though it fell short. In my travels, I could tell a marked difference in my hair and skin when I was outside of FL. Now, with this shower head, I feel the addition of a final stage filtration has done the trick! Easy installation. High quality. Complete satisfaction. We now own 6! Rated 5 out of 5 by Brenda13 from So happy with my shower head I bought this a couple of months ago and I am so happy I did. I have psoriasis and the chlorine in city water really irritates my skin. This has helped to alleviate most of that. Rated 5 out of 5 by Palmetto from Excellent Great product! Water pressure and softness is perfect. You can definitely feel the difference. Easy directions and installation. Rated 5 out of 5 by Evilkneecap from Easy instal I just installed two of these guys at my in laws house and it was super easy. I really appreciate that they included more then enough silicone tape to help with leaks. Nice that I didn't have to go out and buy some just for this simple task. The flow is great and on top of that they look great. Also super easy to install the filter and I do like that it doesn't matter which way you put it in. Makes it super simple. Rated 5 out of 5 by Greytlady from Looks Good I bought two of these a month ago and am glad I did. Totally happy that it has a filter.